Jon Kabat-Zinn, who has been researching the benefits of mindfulness practices since the 1970's at the University of Massachusetts Medical Center says, mindfulness is "The awareness that emerges through paying attention on purpose, in the present moment, and nonjudgmentally to the unfolding of experience moment by moment" (2003).Regularly practicing mindfulness/meditation has been shown to decrease stress levels, decrease the recurrence of depression, decrease anxiety, decrease chronic pain/fibromyalgia difficulties, decrease symptoms of psoriasis and also increase immune functioning. These findings are important for all of us, but especially for people coping with high levels of stress and/or a physical illnesses like cancer.Conversely, high chronic stress levels have been shown to decrease or down regulate the immune system. Likewise, a cancer diagnosis is associated with high levels of stress (See Stefanak, Derogatis, & Shaw, 1987). The person diagnosed feels they can no longer trust their own body. They often feel alienated from friends and family, wonder if they will continue to exist and often feel completely hopeless/powerless over their situation. Obviously, living with cancer is stressful. 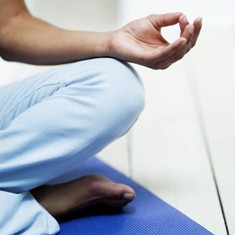 However, practicing mindfulness has been shown to increase cancer patients ability to cope with their situation. Cancer patients who practiced Mindfulness vs. control group: decreased depression, anxiety, anger and confusion as well as increased vigor (See Speca et al., 2000). Davidson, Kabat-Zinn and friends (2003) also found that practicing mindfulness could increase left-brain activity (see more of Davidson's research for left-brain relevance) and significantly INCREASE IMMUNE FUNCTIONING. They randomized two groups- one group to an 8 week meditation training and another to a wait list control group. At the end of 8 weeks, both groups were given the flu vaccine. The meditation group's immune system response was significantly greater than that of the control group, and so was their left-brain activity. Need help getting started with a mindfulness practice? Give me a call 858.880.0145. I have a mindfulness meditation group. I also have individual sessions open. You can also go online and order guided meditation CD's by Jon Kabat-Zinn or Jack Kornfield. Both are excellent. Dan Rather recently covered a story on the power of meditation and it's usefulness. Davidson's work - one of the researchers we talked about above is part of the story- he actually does studies with long time meditators- Buddhist Monks. The Dalai Lama actually encourages them to participate! You can listen to the report on mindfulness here. After clicking this link scroll to the link in the middle of the page and select "April 8th, 2008 - Mind Science" show and then hit Watch Now. You can also find this video on facebook or download the podcast at this link. Davidson, R. J., Kabat-Zinn, J., Schumacher, J., Rosenkranz, M., Muller, D., Santorelli, S. F., Urbanowski, F., Harrington, A., Bonus, K., and Sheridan, J.F. (2003). Alterations in brain and immune function produced by mindfulness meditation. Psychosomatic Medicine. 65, pp. 564-570. Kiecolt-Glaser, J.K., Glaser, R., Gravenstein, S., Malarkey., W.B., and Sheridan, J. (1996). Chronic stress alters the immune response to influenza virus vaccine in older adults. Speca, M., Carlson, L.E., Goodey, E., and Angen, M. (2000). A randomized, wait-list controlled trial: The effect of a mindfulness meditation-based stress reduction program on mood and symptoms of stress in cancer outpatients. Psychosomatic Medicine, 62, pp. 613-622.